The Ashe Co., NC Penningtons have been an area of concentration for me for several years. During that time, I have come to the conclusion that the best way to research the background of the Group 7 Penningtons was to look at all of the Pennington's in the area. I've included parts of VA, NC, KY, and TN in that research and have come to some surprising conclusions. I believe that all of these Penningtons are connected several generations back. DNA research has confirmed that there is a link between the families. The question is - who is the common ancestor. I can't answer that question right now, but there are a number of great researchers who are working on that question. I am working on including information on the two other groups that stay in the NC region. Group 12 which involves the descendants of Samuel Pennington and Group 30 which concerns the descendants of Abel Pennington & Margery Lewis. There is a lot of information that has been gleaned from the Internet and other sources. If these are your lines, I strongly encourage you to do your own research and use this information merely as clues. It is by no means confirmed or proven. As an active member of the PRA (Pennington Research Association), I have benefited from the information that has been provided to me through the Pennington Pedigrees and the Pennington Research Association website at www.penningtonresearch.org - If you would like information on becoming a member, please contact me or write to Melinda Pennington at mgp383@gmail.com . NEW - New Photos of Group 12 ancestors. These include Stephen Pennington & Johanna Spencer, daughters Martha Caroline Penningotn and Orlean Pennington and a family group photo. There is also a photo of Andrew Jackson Pennington's gravestone. He was a brother of Stephen Pennington and son of Samuel Pennington and Elizabeth Anderson. Photos from Emily Kilby and they are on Photo Page 5..
NEW - Photo of Levi Pennington, son of Joshua Pennington and Nancy Sparks on Photo Page 5..
NEW - Gravestone photo of William Thomas Pennington, grandson of Levi Pennington through his son John Anderson Pennington on Photo Page 5..
NEW - Death record for Rebecca Sue Pennington, wife of William Riley Pennington and granddaughter of Joshua Pennington on Photo Page 5. Photo of Jesse Bowling's gravestone. Death record for Levi Pennington and William Riley Pennington, son and grandson of Joshua Pennington on Photo Page 5..
Gravestone photo of George Columbus Pennington, grandson of Levi Pennington through his son John Anderson Pennington on Photo Page 5..
A photo of Elijah "Lige" Bowling, son of Mary Pennington. It is on Photo Page 4. Photo of Fidella Pennington Tritt, a descendant of Edward "Neddy" Pennington on Photo Page 4. Photos of Fred Pennington's grave and the general location. They are on Photo Page 4. Photos of George Washington Pennington and Mary Rebecca Young, his son Fred Pennington and grandson Elmer Pennington. Thanks to Steven Pennington for the photos. They are on Photo Page 4. Photos of Levi Penningtons gravestone. Levi was the son of William and grandson of Joshua Pennington. This photo was supplied by Brenda Penix and is on Photo Page 4. Photos of George Washington Pennington and William Pennington's gravestones. William was a son of Joshua Pennington and George Washington was William's son. They were supplied by Steven Pennington and are on Photo Page 4. Photo of America Bowling supplied by Opal Moore on Photo Page 4. Micajah Pennington was probably born in North Carolina...there are no definitive records yet that proves a birthplace for him or definitive proof of his parentage. Many feel that Benejah Pennington is his father and circumstantial evidence supports this, however, there is no actual documentation that proves that supposition. There is actual documentation of birth dates for Micajah Pennington and Rachel Jones as well as their children. A copy of a Bible entry was supplied with a pension application through Elizabeth Pennington and John Barton. Elige Penington was born December the ninth day in ye 1761. Micage Penington was born December the thirteenth day in ye 1763. Mary Penington was born November the eighth in ye 1765. Levi Penington was born December the twenty first in ye 1767. Edward Penington was born December the twenty ninth in ye 1769. Rachel Pennington was born December the twenty (six) day in ye 1771. Lesebeth Penington was born August the tenth day in ye 1774. Sarey Penington was born November the 24 day in ye 1776. Johaner Penington was born the 24 day of March in the ye 1779. Benejah Pennington born the 15th day of July in the ye 1782. Here is a scan of the Bible records...please remember that the quality is not good. Click the picture and then use your back button to come back to this page. Special Thanks to Esther Bruesch and Wanda Lombardo for supplying me with the photocopy. Micajah Pennington appears in the court records of Rowan County. North Carolina, in 1765-1766. In 1772, he was appointed Constable "in the neighborhood--up the Catawba River". He also was a Justice of the Peace in Wilkes County, North Carolina. Many feel that this was the Micajah Pennington who served with Capt. Enoch Osborn's Company from Montgomery County, Virginia in the Revolutionary War. He apparently d. in Ashe County, North Carolina, about 1812. This is according to a power of attorney as given by his son. Benejah. More information on Micajah was found in a Bible record that gave his birth date as 28 April 1743. His wife was Rachel Jones, b. 12 Jun 1741. This couple was m. on 28 Jan 1761, and were the parents of ten children. They left a huge number of descendants in North Carolina, Virginia, Kentucky, and on westward. Dozens of descendants have contributed to Pennington Pedigrees on their lines. Much of the early information was gathered by Bee Holmes. This is a list of the known children of Micajah and Rachel Jones Pennington. Please click on each name to see further info on their descendants. This information has been supplied by many of the members of Group 7, so therefore it is not proven and should be used as guidelines and not as verified or proven information. It is the responsibility of the researcher to prove the information for themselves. Please notify me if there is any information that is incorrect. Carmen M. Johnson. 1. MICAJAH2 PENNINGTON, SR. (BENAJAH1) was born April 28, 1743 in Rowan Co., NC, and died Bet. 1813-1817 in Ashe Co., NC. He married RACHEL JONES January 28, 1761 in Wilkes Co., NC, daughter of HEZEKIAH JONES and ANN JONES. She was born June 12, 1741 in Westfield, Hampden Co., MA, and died January 12, 1841 in NC. i. ELIAJAH3 PENNINGTON, b. December 09, 1761, Wilkes Co., NC; m. SUSANNAH KELLY, September 08, 1800, NC. ii. MICAJAH PENNINGTON, JR., b. December 13, 1763, Wilkes Co., NC; d. Aft. 1850, Harlan Co., KY? ; m. Bef. 1799; m. (2) NANCY BAKER, August 13, 1812, Madison Co., KY.
iii. MARY PENNINGTON, b. November 08, 1765, Hollow of Yadkin R., on east side of Blue Ridge & New River, Wilkes Co., NC; d. March 21, 1842, Breathitt Co., KY; m. JESSE BOWLING, January 06, 1785, Wilkes Co., NC; b. May 22, 1758, Hillsboro, Wilkes Co., NC; d. March 10, 1841, Quicksand Creek or Crockettsville, Breathitt Co., KY.
iv. LEVI PENNINGTON, b. December 21, 1767, Wilkes Co., NC; d. Aft. 1815, Ashe Co., NC; m. (1) ELIZABETH, Abt. 1788; b. Abt. 1775, NC ? ; d. Bef. 1805; m. (2) PEGGY, Abt. 1805.
vii. ELIZABETH "LESEBETH" PENNINGTON, b. August 10, 1774, Hollows of Yadkin R., on east side of Blue Ridge & New River, Wilkes Co., NC; d. Aft. June 18, 1857, Grayson Co., VA ? ; m. JOHN BARTON, JR., September 06, 1793, Wilkes Co., NC; b. Bet. 1760 - 1765, NC; d. January 03, 1839, Grayson Co., VA.
viii. SARAH "SAREY" PENNINGTON, b. November 24, 1776, NC; d. 1817, Buckhorn, Perry Co., KY; m. SAMUEL JOHNSTON, SR., Abt. 1799, Yadkin Rover, Rowan Co., NC; b. 1777, VA; d. 1861, Buckhorn, Perry Co., KY.
ix. JOHANNA PENNINGTON, b. March 24, 1779, Wilkes Co., NC; d. Bef. 1860; m. DOUGLAS DICKSON, Bef. 1804, NC; b. Abt. 1775, Ashe Co., NC. x. BENAJAH PENNINGTON, b. June 15, 1782, Ashe Co., NC; m. ELIZABETH STROTHER; b. 1784; d. Bef. 1814. We have very little info differentiating the difference between these two Benajah Penningtons. The one below is probably the son of Andrew Pennington, Micajah's brother. However, we have no proof of that information. The Benajah Pennington above...is most likely to be the son of Micajah Pennington...he is recorded on the Bible page above and is also responsible for the power of attorney document which gives Zephaniah Bell the power of attorney regarding his father's will. 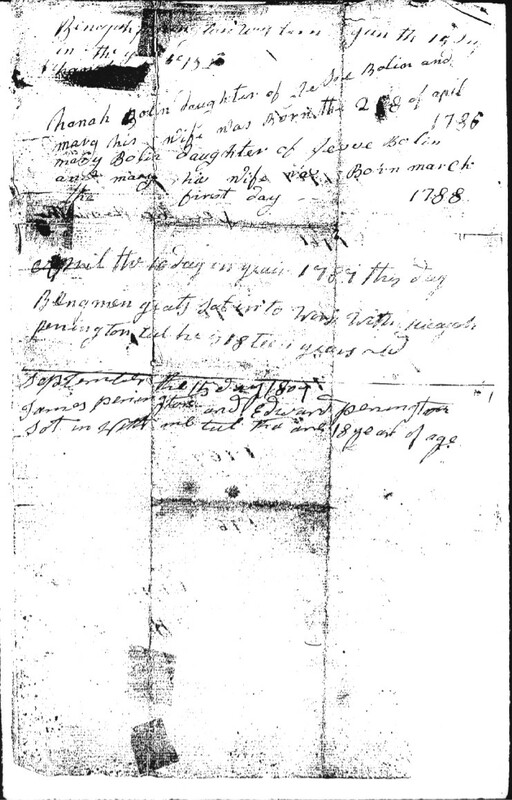 This is how we know that Micajah Pennington died around 1813. The document was recorded in Barren Co., KY. Please go to the Pennington documents page to look at the document for yourself. b. August 18, 1770, Grayson Co., VA; d. October 12, 1855, Stockton City, Cedar Co., MO; m. MATILDA EMERY HEMBREE, July 26, 1814, Roane Co., TN; b. June 25, 1799, Spartanburg, Spartanburg Co., SC; d. August 20, 1878, Stockton City, Cedar Co., MO. Please remember that this info is the product of members of the Pennington Research Association and myself. It represents our work and research. This page last updated August 25, 2008.